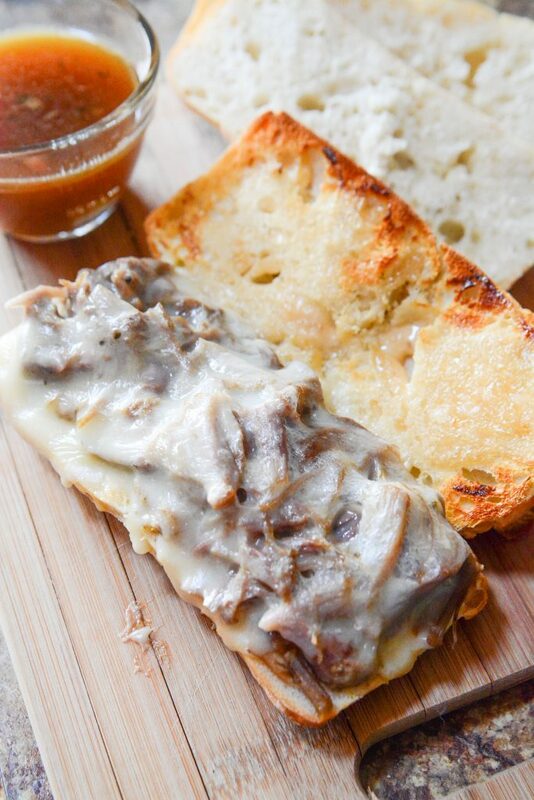 Beef dips on their own are a delectable sandwich. Period. There’s just no debating that subject. ESPECIALLY when you have a really rich, zesty gravy to dip that soft bun into. So if you could improve that beef dip, what would you do? I have the solution. 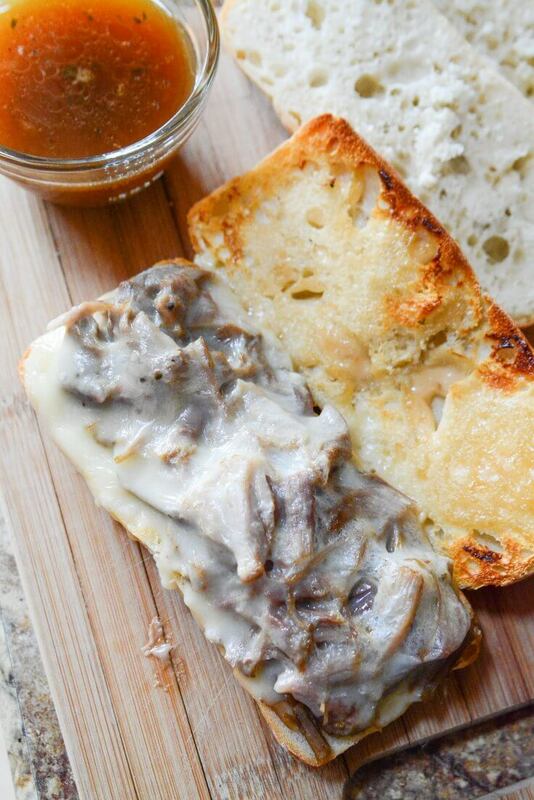 An Instant Pot Mississippi Pulled Pork Dip! Yes, that is a handful, both literally and figuratively! A regular Mississippi pot roast is such an amazing tasting beef pot roast and so easy to make, it’s almost kind of funny. In fact, The New York Times graces this recipe “The pot roast that owns the internet”. And, yeah.. I believe that! But you’d never expect the combination of ingredients with a PORK roast to turn out to be such a spectacularly flavored dish!! This Instant Pot pot roast (ha! that sounded funny!) is really easy to put together. Press saute on the on the Instant pot panel, and place a bit of oil in the insert. Place the roast in the pot and sear it on all sides. If it doesn’t fit all in one go, simple cut it into the largest pieces you can to make fit. After searing, sprinkle one packet of ranch seasoning, one packet of au jus mix, the butter (just throw it in there), the pepperoncini peppers and juice, and you’re good to go! I don’t care for too many peppers themselves, but I love the juice so I used the whole cup for this pot roast!!! If you think it will be too strong, go half and half with water or broth. 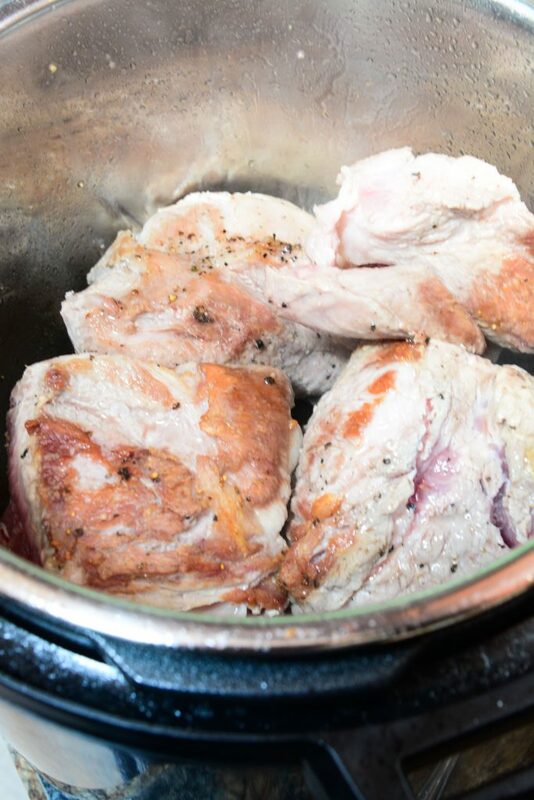 After cooking, take out the pork roast, and with two forks, shred the meat. Set it aside. Pour the cooking juices into bowls for dipping. Toast a french roll, baguette, sub or torpedo bun (whatever you have really) that’s been cut in half lengthwise. After toasting, butter, and spread on some smoky horseradish if you have it. If not, just a smear of mayo will do. 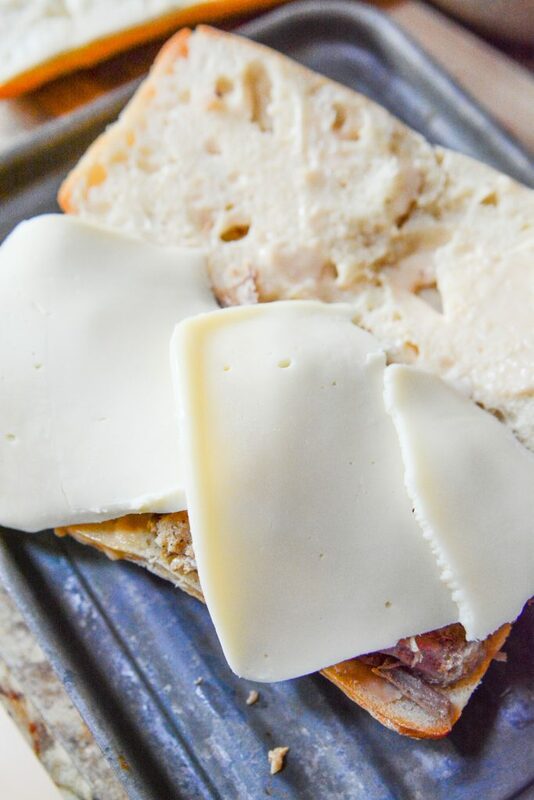 Pile that shredded pork onto the bun, and cover with a few slices of Swiss cheese, provolone, sliced mozzarella, etc – really, any melty cheese will definitely fit the bill. Place the beef dip back under the broiler if you want it all melty and ooey gooey. Take it out and place the top part of the bun on it, and dip away! The combination of the rich and zesty dipping juice with the super tender shredded pork meat and the cheese – all hit the winner bell for me with this fantastic recipe. DEFINITELY spent the time to sear the meat. It adds extra flavor and is worth every second you take to do it. Please toast the buns. 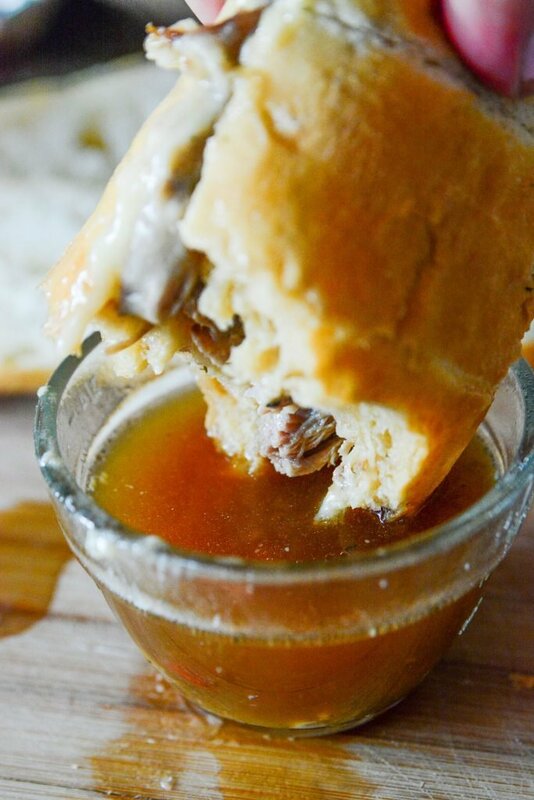 It adds structure to the bun so that it can hold even more au jus without getting all soggy and fall-aparty. This recipe can be done in a slow cooker, but please do try it in your Instant pot. It makes dinner on the table super quick and super tasty! This recipe will make enough for a crowd! In fact. you might want to make extra au jus, just so people can be all extra with it 🙂 If you liked this recipe, you might like to give my Instant Pot Shredded Corned Beef and Cabbage recipe a try! The Instant Pot Mississippi Pulled Pork Dip is a recipe that I’m pretty sure your whole family will love. One suggestion though. I would probably leave the horseradish off the buns and just go with mayo for any littles. The horseradish might be too robust for their palates and mayo would be a much better choice. I can you tell you that the favorite part of the recipe for kids is THE DIPPING!! 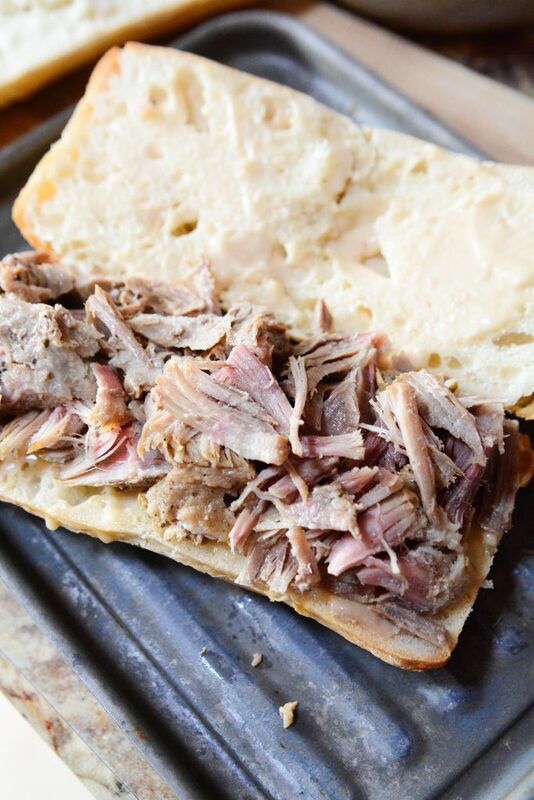 This Instant Pot Mississippi Pulled Pork Dip is a twist on the classic Mississippi Pot Roast, traditionally done with beef, is made super quick in the Instant Pot with a pork roast instead!! Shredded pulled pork made delicious into a bun, with cheese, and dipping au jus or juice. It's the perfect sandwich!! sear the roast on all sides. You may have to cut the roast into large chunks so it all fits. Cover and place the unit to "sealing"
Press "manual" and set the unit for 60 minutes. At the end of cooking time, let it do natural release until the pin drops and it's safe to open. Remove the pork and shred with two forks. 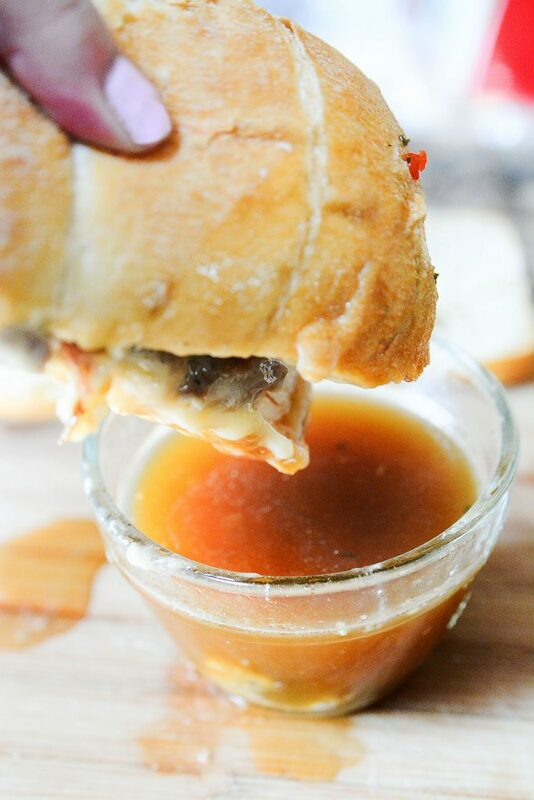 Divide the au jus from the pot into dipping bowls. 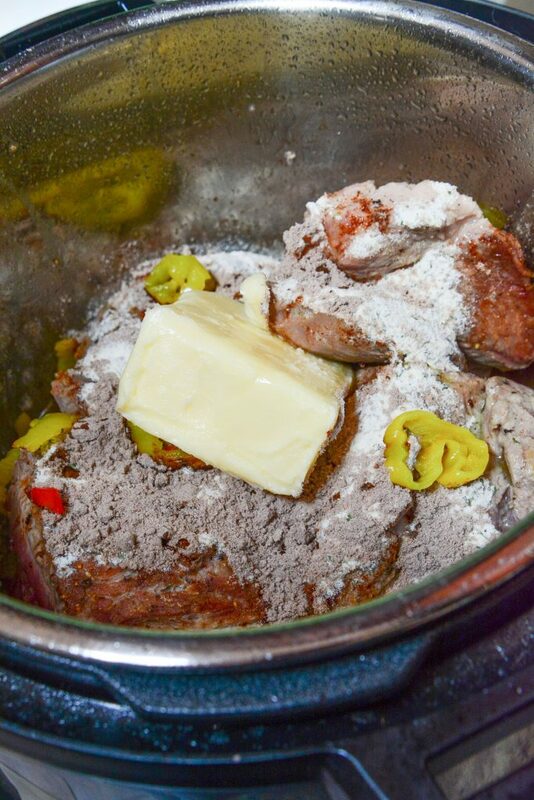 Place the pork onto toasted buns spread with horseradish and cover with slices of cheese. Does anyone else find that the stick of butter makes it too greasy. I have to refrigerate it till the next day then skim the fat off. I’ve even cut back to a half stick but still have to skim. I don’t use pork with a lot of fat in it either. Is it just me? Hi Norma! Thanks for commenting 🙂 So, I normally don’t find it too greasy with the half a stick. However, certainly feel free to cut down to just a few tablespoons if you want. 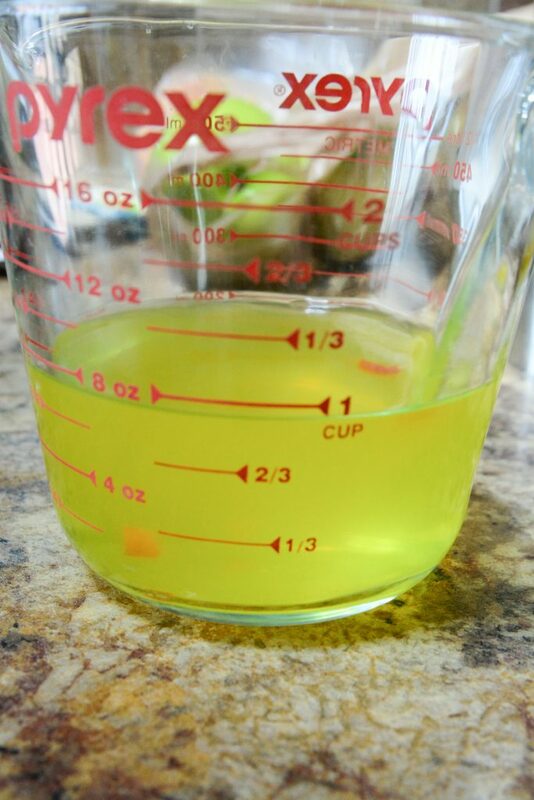 The most important part (for the instant pot) is using the right amount of liquid. I prefer to use a pork shoulder roast because they “pull” better due to the higher fat content that renders out while cooking. Chilling the pork afterwards is definitely a way to remove the fat if you don’t like it. 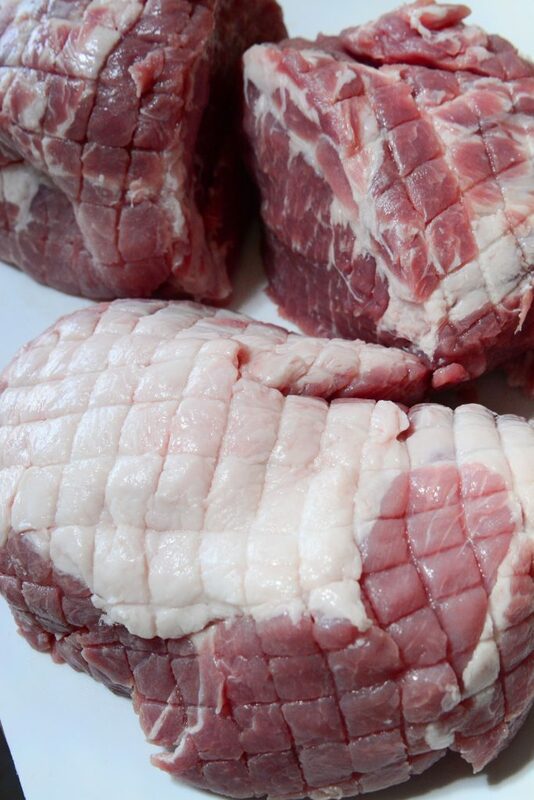 Personally, I dont like to use a leaner cut of meat because the less fat, the harder it will be to “pull” and I feel it will be a lot drier as well. BUT.. those are my preferences. Thanks so much for commenting Norma! Have a wonderful day!